Until recently, I managed to travel carry-on only most of the time, something that preserved the life of my inexpensive soft suitcase far beyond expectation. However, the proliferation of checked bag fees has caused thrifty passengers to stuff as much stuff as possible into their carry-ons, making the overhead bins a nightmare. My employer is willing to pay for the first checked bag when I travel for work, which is 90% of cases or more, so thrift is slightly less motivating for me. I suspect that checked-bag fees have also increased the size of the average piece of luggage, making it perilous for my small soft-sided bag. So, like U.S. drivers of 10 years ago who preferred gas guzzling SUVs for their “safety,” I decided to fight back with a hard-sided suitcase. After a trip to Europe in 2008 in which one of our soft-sided suitcases was essentially destroyed, Sarah was on board with this idea. 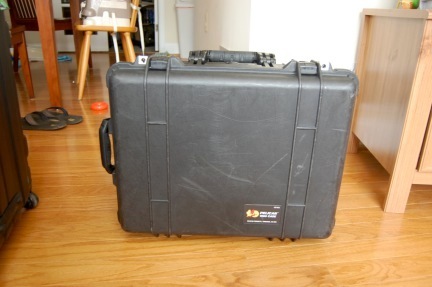 I proposed a Pelican case at the time, but she thought it was ugly and “looks like a toolbox.” Since it’s a well-known fact that women drive household purchasing decisions, it should be no surprise that we ended up with a set of highly-rated, yet inexpensive hard sided suitcases. After one or two domestic trips, one of these developed a crack. The trip to Greenland in January of this year was impetus for me to take matters into my own hands: I bought a Pelican 1560 (empty with no foam) and the 1569 lid organizer. The genius of the 1560 is that you can’t load it to more than 23 kg with “normal” contents. Although, Sarah—and airline, security, and customs employees the world over—would argue that very little that goes into my bags is indeed “normal.” It’s only a little more expensive than a department-store suitcase and definitely cheaper than most of the high-end brands. And, of course, it’s indestructible…and it floats. What’s not to like about that? There is one downside—it is almost always loaded to near 20 kg, so it’s heavy. But, until the airlines force us to pay by the kg, I have my suitcase for life. Upon return from our latest trip yesterday, the two larger hard-sided suitcases had big cracks in them. “I think all of our suitcases should be Pelican cases,” Sarah remarked as we left the airport.